Trying to win over Texans by giving them a new pickup truck sounds too stereotypical to be true, but that’s exactly what Tesla Motors CEO Elon Musk is doing. 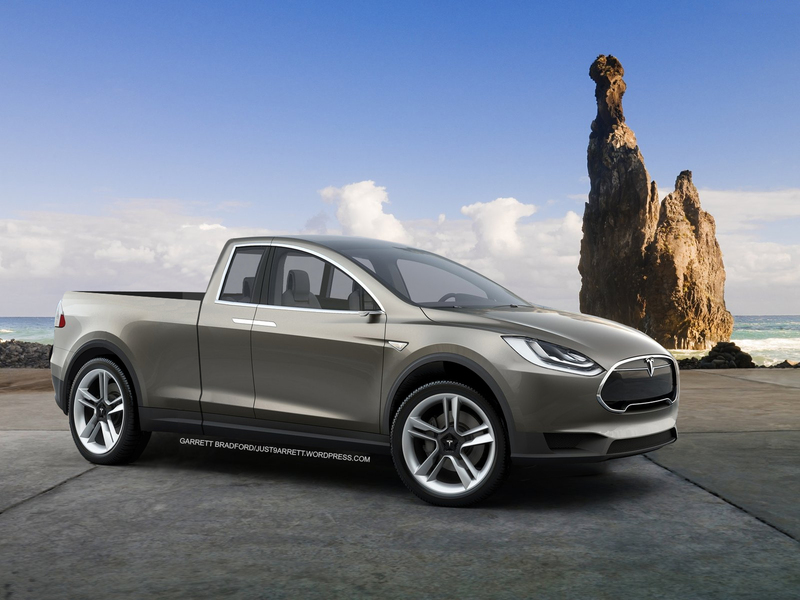 What might a Tesla Truck look like? Digital artist Garrett Bradford created the above image using design cues from current Tesla models to come up with an educated guess. Musk is currently fighting Texas legislators, who claim Tesla’s company-owned retail stores violate laws prohibiting car manufacturers from owning dealerships. The Tesla stores (photo below) are modeled on Apple Stores, and are usually located in upscale shopping malls. They also operate more like retail stores than conventional dealerships: there’s no inventory of cars and customers are directed to separate service centers if they have any problems with their purchases. Tesla currently runs two stores in Texas: one in Houston’s Galleria mall, and another in Austin’s Domain shopping center. While many states prohibit car companies from selling directly to customers, Tesla goes to extraordinary lengths to skirt the Texas laws. Tesla stores in Texas do not offer test drives and do not offer pricing information, although it is easily obtainable by going to Tesla’s website. Once a customer orders a car, the transaction is funneled through Tesla’s home base in California. Cars are either delivered at the factory or to the customer’s home. Either way, they never have to set foot in the showroom again. Service centers are also limited in the way they can communicate with customers. Musk apparently thinks this is too much of a hassle, and is trying to change the law. That’s where the pickup truck plan comes in. “I have this idea for a really advanced electric truck that has the performance of a sports car but actually more towing power and more carrying capacity than a gasoline or diesel truck of comparable size,” Musk told Automotive News. If Tesla does decide to build a truck, Musk says it would likely require a new factory. He said Texas would be a “leading candidate” for such a plant. While we’ve heard fantastic product ideas from Musk before, the Tesla Model F-150 is definitely the most outrageous. Tesla would have to design a second platform from scratch; the unibody that underpins the Model S won’t cut it for a truck. Of course, Tesla designed the Model S from scratch, but a truck also doesn’t seem to fit the company’s mission. The Model S is a luxury car, and so is every other model Tesla has proposed so far. “Luxury trucks” are still a bit oxymoronic (Lincoln Mark LT, anyone? ), but trucks have been getting more and more civilized – and tech heavy – as of late. While Tesla officials have discussed turning the company into a full-line carmaker, jumping from a luxury sedan to a pickup truck without anything in between is just too crazy to be believable. After all, Tesla still hasn’t put the Model X crossover into production, and recently canceled plans for a sub-Model S sedan. An electric truck would be cool, but it doesn’t seem like that is what Musk is really proposing. Texas lawmakers might be willing to give him what he wants if it means netting a new factory and its many jobs. Musk is a man that follows through with his visions, but this time he seems to be visualizing a network of company-owned car stores, not a new EV.